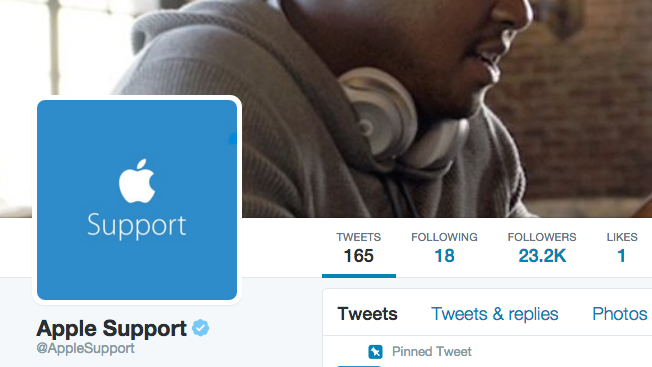 After years of eschewing social media, Apple has finally joined Twitter. This morning, the Cupertino, Calif.-based brand launched an account to "provide tips, tricks and helpful information when you need it most." Within two hours of opening the account, the page racked up 24,000 followers, posting more than 184 tweets to folks with questions about their iPhones, iPads and laptops. @Thealihage We don't like stuck apps either. DM us your iPad model and iOS version and we can start there. Apple's reversal of strategy underscores that it likely needs to use as many channels for customer service as possible—just as any other major brand. And the move highlights how Twitter has been evolving into an effective customer service platform since opening up direct messaging in April 2015. Despite not having an account for the Apple flagship brand before today, the company isn't completely new to Twitter—it has opened Twitter accounts for iTunes and Apple Music in the last few years. Additionally, it purchased ads on Twitter in the past, including Promoted Trends—which cost roughly $200,000—for launches like the Apple Watch and iPad Air 2. Apple's limited social media strategy also includes the 2014 launch of a Tumblr page—which now seems to have disappeared—to promote the iPhone 5C, and the company has Facebook and Tumblr accounts for iTunes and Apple Music.